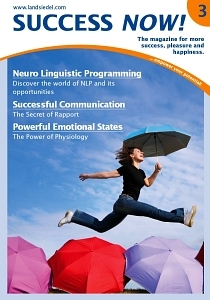 Perception plays a very important role in NLP. Only if we are able to perceive as many subtle aspects as possible of the body language of another person can we respond to it and shape the further course of our communication based on this information collected by our senses. Because of this, there is no substitute for open sensory channels. Calibration is sensory fine tuning to the behaviour of another person. Certain inner states correspond with specific visible characteristics. When I lead someone through a process it is important to study these characteristics in order to control the process and know what state the person is in at that moment. With accurate calibration I receive feedback telling me whether my interventions are successful. This additional information enables me to adapt my communication appropriately. So, for example, after having adjusted to the other person I can see by a small change in their face if a suggestion is being favourably received or if further persuasion is required. Calibration is the ability to recognise visible features and match them to the person's condition. 1. A thinks about a person he/she likes for around 45 seconds (= person X). B helps A to get as vivid a memory of him/her as possible. B and C calibrate, e.g. in terms of breathing, facial expression, skin colour, etc. 2. A thinks about a person he/she does not like for around 45 seconds (= person Y). B and C calibrate, e.g. in terms of breathing, facial expression, skin colour, etc. 3. B asks A the following questions which A answers by thinking of the respective person without saying anything. Now B and C deduce from A's physiology whether their answer is person X or Y. ▪ Which person has more charisma? ▪ Which person has darker hair? ▪ Which person do you see more often? ▪ Which person .... ? B and C ask questions until both can reliably recognise A's non-verbal answer. If you are completely wrong, go back to steps 1. and 2. and start calibrating again.